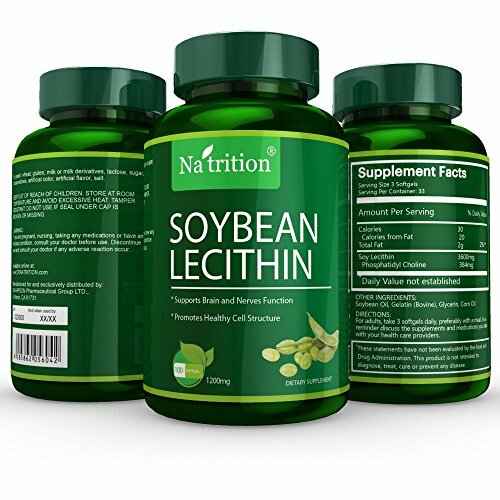 Lecithin is an important natural source of Choline and Inositol, two nutrients important for the proper functioning of the body. Made in U.S.A. - FDA-Inspected Facility - We strictly follow good manufacture practices and deliver the best quality product to customer! MONEY-BACK GUARANTEE - Pack of 3 bottles, total 300 Softgels - 3 Softgels per day for Maximum Strength and Potency - DON'T feel the effect of resveratrol? NO PROBLEM! We offer 2 MONTHS money-back guarantee. If you can't feel the quality or you doubt the quality after purchase, just leave us an honest and unbiased comment, and we will refund immediately! Your opinion will always help us to improve every detail in our services! Manufacturer: USA HPSON Pharmaceuticals Group LTD. Publisher: USA HPSON Pharmaceuticals Group LTD. Studio: USA HPSON Pharmaceuticals Group LTD. If you have any questions about this product by Na'trition, contact us by completing and submitting the form below. If you are looking for a specif part number, please include it with your message.